Planned Parenthood Controversy Hangs Over Komen's Fundraising Races : Shots - Health News Participation is down in races to raise money for the Susan G. Komen for the Cure charity. Some Komen supporters remain skeptical about the group, even though a decision to cut funding for Planned Parenthood was reversed quickly. 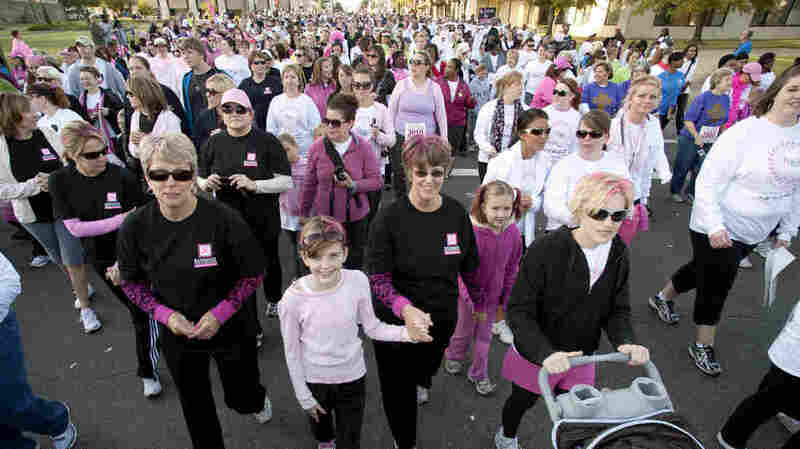 On Saturday, the Susan G. Komen Global Race for the Cure will be run and walked in Washington. This year, the field won't be so crowded. The race in the nation's capital is one of the breast cancer charity's biggest fundraisers each year. But as Pam Fessler reports on Morning Edition, participation this time around is way down. About 25,000 people are expected to take part this weekend, off around a third from last year's 37,000. Races in other cities, including Seattle, Tuscon, and Winston-Salem, N.C., have seen similar declines. The drops follow the group's controversial decision to discontinue funding of breast cancer screening by Planned Parenthood. Although Komen quickly reversed course and some top executives with the Komen foundation subsequently left, hard feelings have lingered. "Probably an issue for me is an issue of trust and follow-through," Democratic Congressman Mike Honda of California said. He'll stay on the sidelines this year. Last year, the team from his office raised $10,000 for the Komen race. Honda says Komen does great work, but he wants to be sure the group fulfills its promise not to let politics influence its decisions, as critics claimed they did . "I wanted to see whether the Komen group will, in fact, fund groups like Planned Parenthood as a grantee," he said. Andrea Rader, a Komen spokeswoman, acknowledged that some races have suffered, but said it's difficult to know the long-term impact. She didn't want to go on tape, saying that the group wants to get past the current controversy — and focus on fighting breast cancer. Groups that depend on funding from Komen are concerned. "We're going to have to make some very hard decisions if we don't get the same amount of money," sais Maria Gomez is president and CEO of Mary's Center, which uses Komen funds for breast cancer screening and support for low-income families in Washington. The group has received grants of up to $100,000 from the annual race. Gomez says without the money, they would have to cut staff or services.